AgroAtlas - Relatives - Larix sibirica Ledeb. 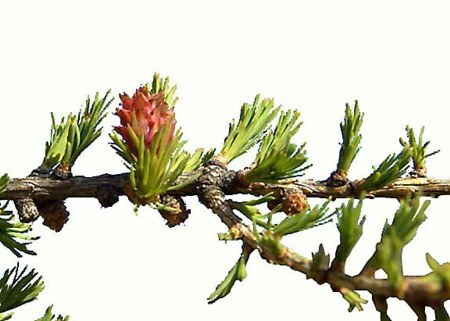 - Siberian Larch. Larix sibirica Ledeb. - Siberian Larch. Family Pinaceae Lindl. genus Larix Mill. Straight tree with pyramidal crown, up to 40 m tall and 1.8 m diameter, lower part of trunk often thickened conically; young branches smooth, glossy, light straw-colored. Leaves in bunches by 30-40, narrow-linear, 2-4 cm long and 0.1.1 mm wide, with obtuse end. Young cones reddish, mature ones light brown, ovoid, 2-4 cm long and 2-3 cm wide; outer surface of scales densely covered with fulvous hairs, scales 13-20 mm long, 10-15 mm wide, ovate, orbicular-ovate or orbicular, with rounded, flatly cut or less often slightly emarginate margins, 22.40 in number. Seeds obliquely obovate, 4.5 mm long and 3.4 mm wide, yellowish with dark strips and speckles, their wings almost straight at one side, flatly rounded at another side, 8.17 mm long and 4.6 mm wide. Deciduous, monoecious, anemophilous, anemochore. Northeastern European part of the former USSR, West Siberia (except for the southwest), Altai, southwestern East Siberia, Saur, Tarbagatai; Northern Mongolia, Northwestern China. Partly occurs mixed with other conifers, partly (especially in mountains) forms pure, rather light stands. Prefers stony, sandy, generally dry soils. Nevertheless, larch forests form associations not only with semishrubs and herbs, but also with lichen and sphagnum cover. Sokolov SI., Svjaseva OA., Kubli VA. 1977. Ranges of trees and shrubs of the USSR. V.1. Leningrad: Nauka. 240 p. (In Russian). Tolmachev AI., ed. 1974. Flora of the Northeast of European part of the USSR. V.1. Leningrad: Nauka. 275 p. (In Russian). Krasnoborov IM., ed. 1988. Flora of Siberia. V.1. Lycopodiaceae - Hydrocharitaceae. Novosibirsk: Nauka. 199 p. (In Russian).